Playrooms and nurseries are some of the most fun spaces we get asked to do. We enjoy designing in “miniature” and we love to talk to our youngest clients about their needs. As a mom myself I’m very aware of how much stuff accumulates so storage is important and how much time is spent in playrooms. The design of the room has to be functional and also engaging for imaginative play. Project by Chango and Co. This is Chango and Co’s playroom design. I like this room a lot for a few reasons- first, lots of open space. Open space in playroom = endless possibilities for play and movement. This is a luxury many of us New Yorkers don’t have so let’s talk about what else is going on this room that we can take away for ourselves. The sectional seating is great for adults as well as quiet reading time for kids. Really any amount of comfortable adult-size seating in playroom is a positive. The sink area allows for snacks to be served as well as clean-up for art. Lastly every playroom needs at least one whimsical element and in here it’s the swings! Who wouldn’t want to sway back and forth indoors!! Still on the whimsical elements with this image. This “playroom” design by Studio DB is both super fun and shows that not all play spaces need to be designated to a room. I can see this being very popular with the adults in this household as well. Need to get down the hallway faster, just take a ride on this zipline swing! The fun wallpaper isn't too "kiddish" and helps give this space movement while enforcing the idea of the zipline. This is a Kellie Franklin project in a Brooklyn townhouse. Talk about treating wall space as value real estate! This small desk and display area works well for doing a little homework and showing off art, awards, collections, etc. It becomes a “living and breathing” element in the room with all the various ways to hang things- hooks, cork board, ledges, magnets! It’s easy to display anything you might want to with all these hanging options. Here is an example of our point above about adult-size comfortable seating! In this Kellie Franklin project there is room for the whole family to sit together and watch a movie. The accent wall showing Andy Warhols flowers helps break up the solid color fabric on the sofa. This wallpaper is great and if you haven’t been to Flavor Paper’s website you need to head over there (after you finish this blog post!). This particular one is on mylar metallic paper so the flowers have sheen to them. The side table in the corner is an upholstered ottoman/stool with a fitted tray on top. Dual purpose- always good to have in a space like this! Ok back to maximizing wall space! 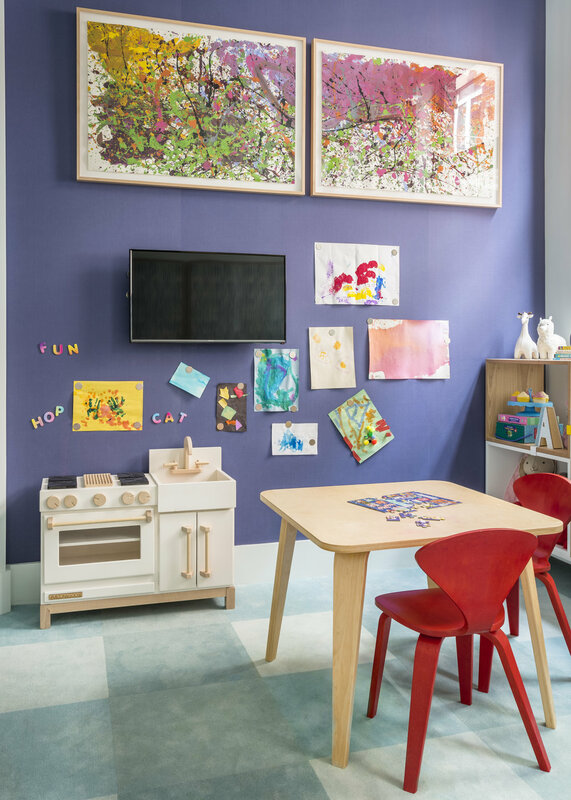 This playroom image is from a Tribeca project we worked on with the most adorable little client. All the artwork in the image is her own (including the framed piece!). On the wall we used magnetic, fabric-covered wallpaper. This magnetic wall can be used to display art and play with magnetic toys/letters. Everything hanging on the wallpaper helps disguise the tv (which is a necessity but not a pretty looking one in most rooms). What is important to you in a functional playroom space? Share your thoughts in the comments below.